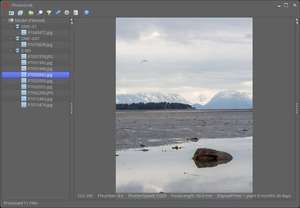 PhotoGrok was created as a small, accessible and useful tool that is able to categorize images and various other multimedia files by metadata. By default, when looking at raw files you're seeing the preview image embedded in the file (extracted by ExifTool). It's possible to configure PhotoGrok to view RAW files using GraphicsMagick and dcraw. See below. Version 2.62 is a freeware program which does not have restrictions and it's free so it doesn't cost anything. For security reasons, you should also check out the PhotoGrok download at LO4D.com which includes virus and malware tests. Additional screenshots of this application download may be available, too.